By LUDWIG VON KOOPA - That article title makes me wonder why "two" isn't pronounced "twoh". 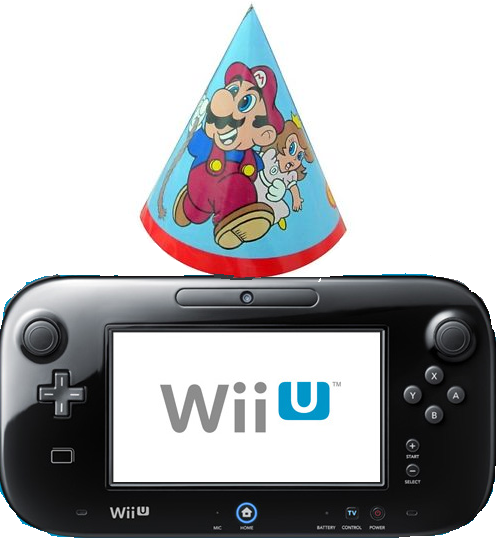 Everything in the Nintendo-sphere is congratulating the Wii U for turning two years old today, November 18. In America, anyway. Last year, I wished the Wii U happy birthday when it turned one year old. This year, I want to review the five reasons I said to get a Wii U that I wrote about in that article. ...Good luck keeping that thing on your GamePad. By the way, the GameCube is also 13 in America. EarthBound is still worth your $8 and the Wii U is still the only way to get it. It's also the only way to play EarthBound on the toilet, which is notably important against Master Belch. The Wii U's Virtual Console is really good now. It's packed with Capcom's Mega Man games, for one. And it has a lot of other desirable NES, SNES, and Game Boy Advance games, like Punch-Out! !, Kirby: Nightmare in Dream Land, Yoshi's Island: Super Mario Advance 3, Donkey Kong Jr. Math, and Mario & Luigi: Superstar Saga. ...More to come, too. Plus, you can still play everything that was on the Wii Shop Channel. I mentioned that Miiverse is a big thing, and it really is. So much so that I cried when my access to it disappeared. It's no longer exclusive to the Wii U thanks to the flood of 3DS users, but the Wii U is still the best platform to access Miiverse from. I myself have have spent nearly 1,000 hours on Miiverse on the Wii U. I'm almost there! (I'll let Miiverse know when I hit it.) I wrote more on how Miiverse is like NSider concerning its moderation. Local multiplayer is still going strong on the Wii U. Since last year, you have cooperative and other kinds of multiplayer play in games like Ubisoft's Child of Light, Mario Kart 8 (if you can stand it), Wii Sports Club, and Donkey Kong Country: Tropical Freeze. Speaking of local multiplayer and controllers, Super Smash Bros. For Wii U is still on the way. ...In fact, it's coming out this week. That's the best reason to get a Wii U right now. Super Smash Bros. For 3DS was basically just a demo for the greatness of the Wii U version. But if that's not enough, Splatoon is coming at the first half of 2015. It comes down to the games, and the Wii U has them according to gamers. The PlayStation 4 does not really have the game library it should have for the sales it has gotten, still according to gamers. With that in mind... What do you choose for a game console? Here is to another great Wii U year! Ludwig's NNID is PrinceOfKoopas. You can Wii U friend him (please do not send a blank friend request) and Follow him on Miiverse. It's a good idea.